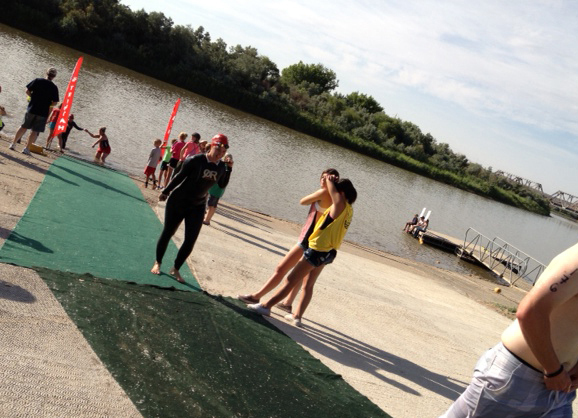 Utah’s only down river triathlon takes place in Green River, Utah, and is gaining in popularity. Begun in 2012 by Triutah, this race started as an olympic distance only but now includes the sprint distance as well. It’s a one-mile swim for both groups and then breaks into the standard distances for spring and olympic. I did the olympic distance the first year they had it with what felt like thirty other people. I had the course to myself. My swim took only fourteen minutes since the river was at flood stage. This last year the race has grown quite a bit now that it includes the sprint distance. A downriver swim that goes along the shoreline giving beginners to open-water extra confidence. The first third of the swim you could walk during 2013’s drought year. Great first time race for both distances. The race is in a small town, making for quiet streets while biking. The run is through a golf course. Very well organized, including assigned transition spots. Still small enough that it’s not overwhelming or super competitive. There was only six or seven in my division. They do a mass start (which will probably change when it gets more popular). This makes it more fun if you want to compete with friends who are in other divisions. Takes place at Green River state park, which has shaded campgrounds and showers. The sprint distance has very few hills and the olympic not that many more. Bless Triutah’s heart. They soaked small towels in ice water and wrapped them around our necks when we crossed the finish line. At 104 degrees, I could’ve kissed them. You have to drive to Green River. The mosquitos will eat you alive. I counted thirteen mosquito bites (disclaimer: we camped out the night before, which is when we got most of them). The race doesn’t start until eight, which usually isn’t a con but in Green River in the summer it gets hot fast. The olympic run is a two-loop course. I tend to find it disheartening to run past the finish line only to go one more loop. The water can be shallow (this can vary year to year). The biggest complaint I heard on the swim was lots of people had stubbed toes and skinned knees. However, I laughed as my brother and I kept standing up to walk.